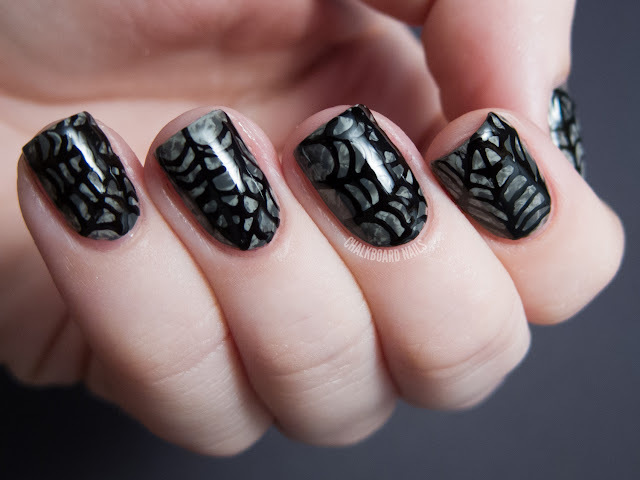 Another Halloween manicure? Oh yeah, you know it! This manicure was actually my first ever Saran wrap marble attempt, even though I am posting it after the purpley one from earlier this week. I began with a base of Sally Hansen Wet Cement, and then once that was dry I painted on a layer of LCN Tokyo Expression. Then I swiftly took a wadded up piece of plastic wrap and dabbed it on to create the pattern. 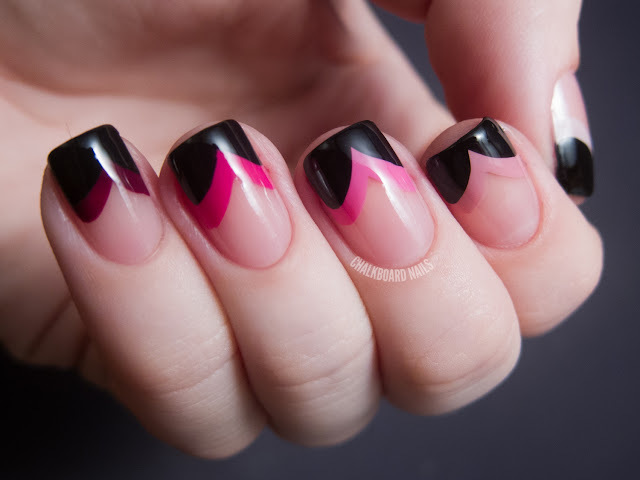 The final step in this manicure was the webbing. I actually used a Migi nail art pen this time, instead of my usual nail art brush. It was an interesting experience, and I while I do think I need a bit more practice to refine my lines, I was pleased with the outcome. The Migi pens are different from, say, the Sally Hansen ones. The SH ones are more like actual pens, where you just hold it and draw on. My experiences with those pens have not been very good at all... I don't think they draw well, they are watery, and the lines I draw don't always hold their shape. These Migi pens are the type where you squeeze the body of the bottle and it comes out a metal nib. The pen I used also drew on kind of thick, but I'm sure that was more my inexperience with it than anything. The topcoat mostly took care of that but I could still feel a few bumps here and there. 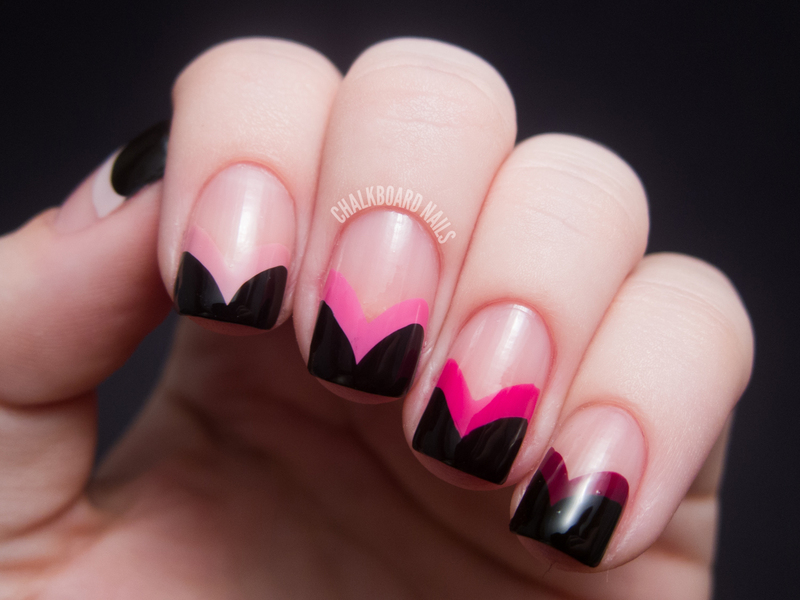 It's Friday, and I've got another Halloween manicure for you! 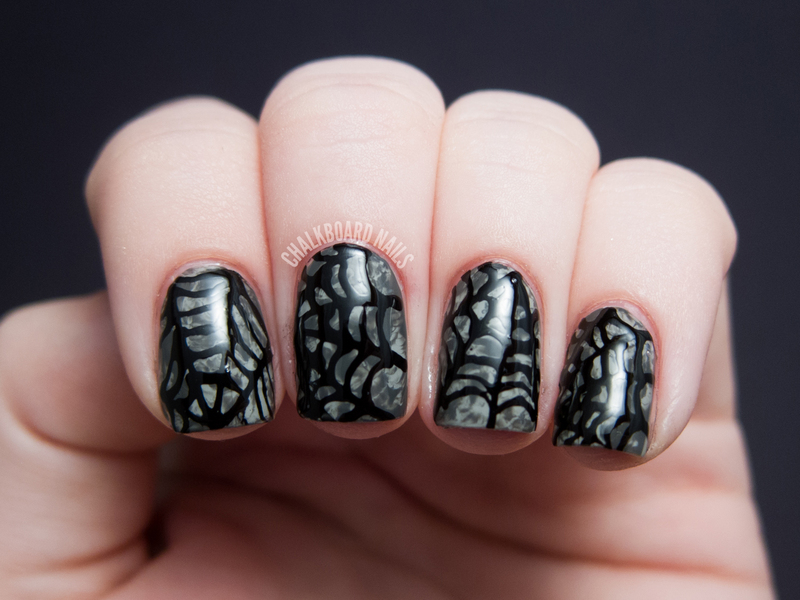 This manicure is meant to look spooky and eerily ethereal, like spirits floating around on Halloween night. These absolutely make me think of Slimer from Ghostbusters, who is apparently made entirely of ectoplasm. 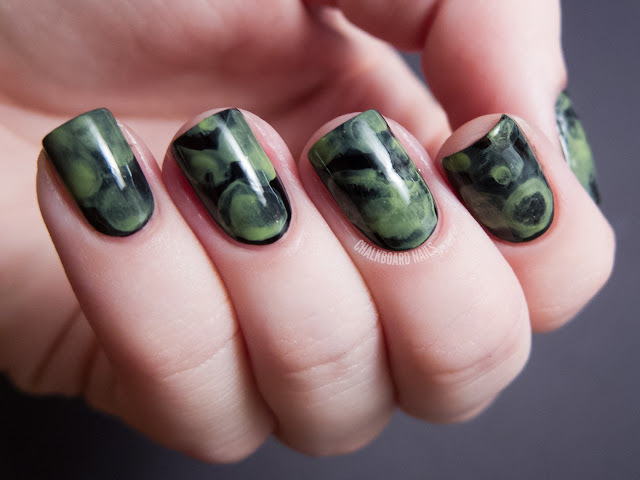 I didn't originally know what he was made of, but it works out great because I had already been referring to it as an ectoplasm manicure in my head. 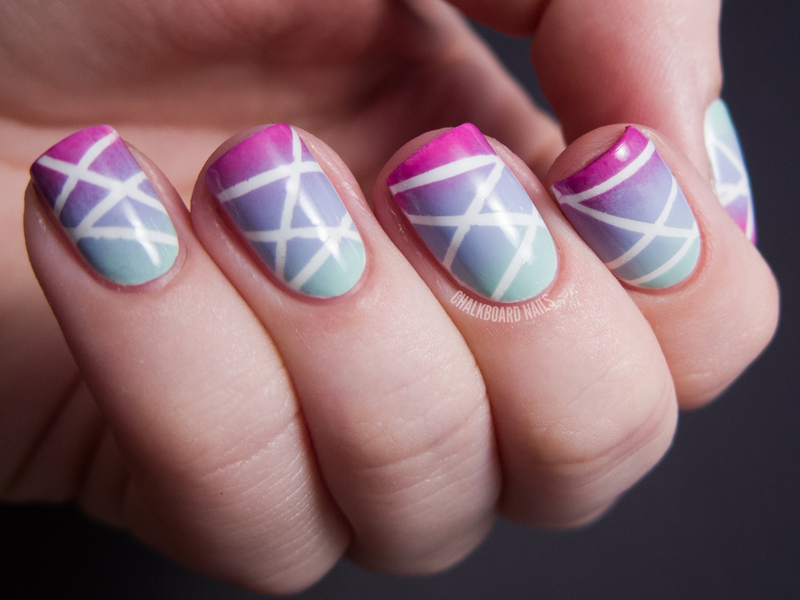 This manicure was done using only two colors and the watercolor technique. For the base, I used American Apparel Hassid. The green is LCN Fanappleistic. You can find a tutorial for the watercolor method on Beauty Geeks. If you're not into the "Slimer look," try thinking of these as jellyfish in the deep ocean! Tomorrow's post is another Halloween design. Till then, have a nice Friday! Good morning! 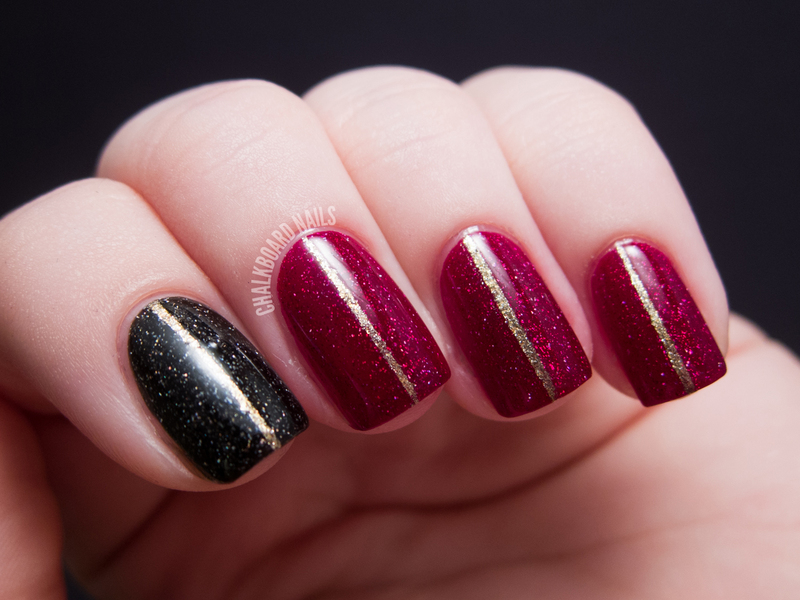 Let's start off the week with some indie swatches, what do you think? The collection we're going to be looking at today is the Pretty Little Liars Collection by Different Dimension. I don't watch the show myself, but I sure do like these polishes! 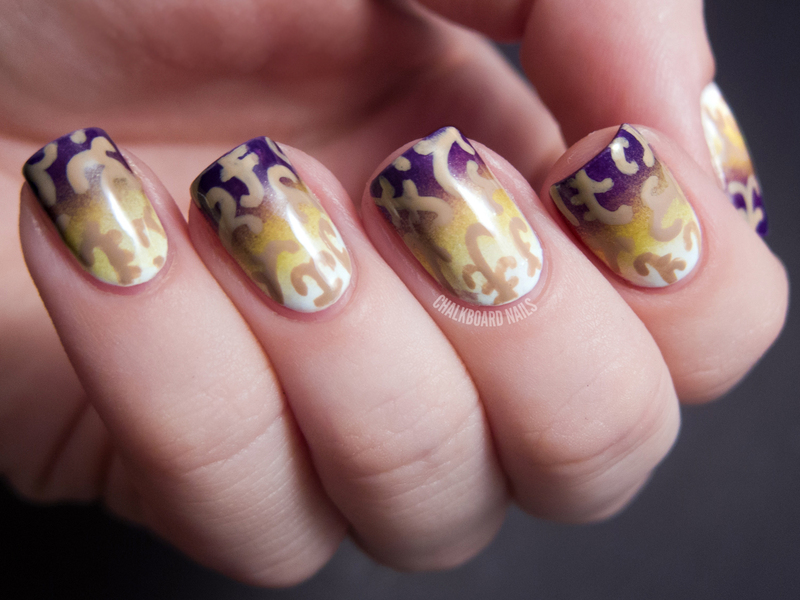 Aria is a gorgeous heavy purple shimmer topcoat. It looks whitish in the bottle and is best layered over another color. I've shown it here over American Apparel 7th and Alameda. 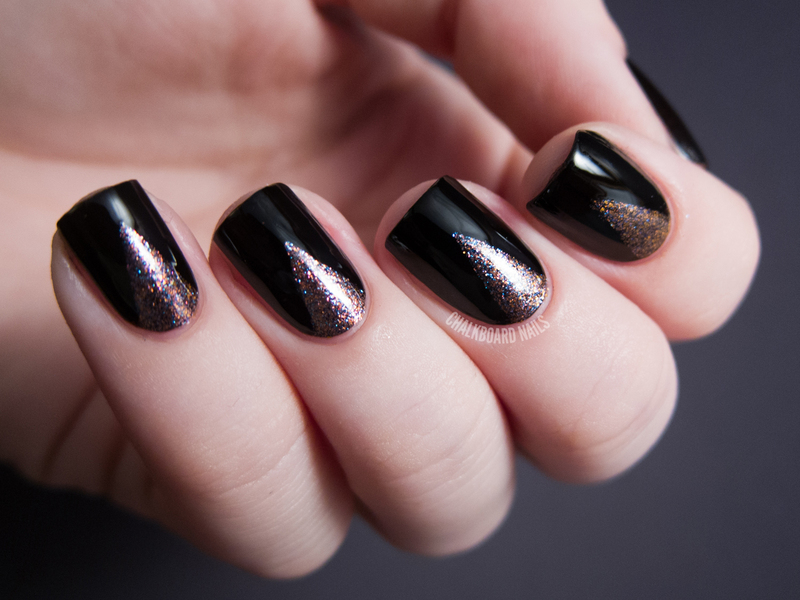 It will lighten the color you put it over a bit, but is definitely worth it for the amount of shimmer you get. It's really ethereal and absolutely noticeable. 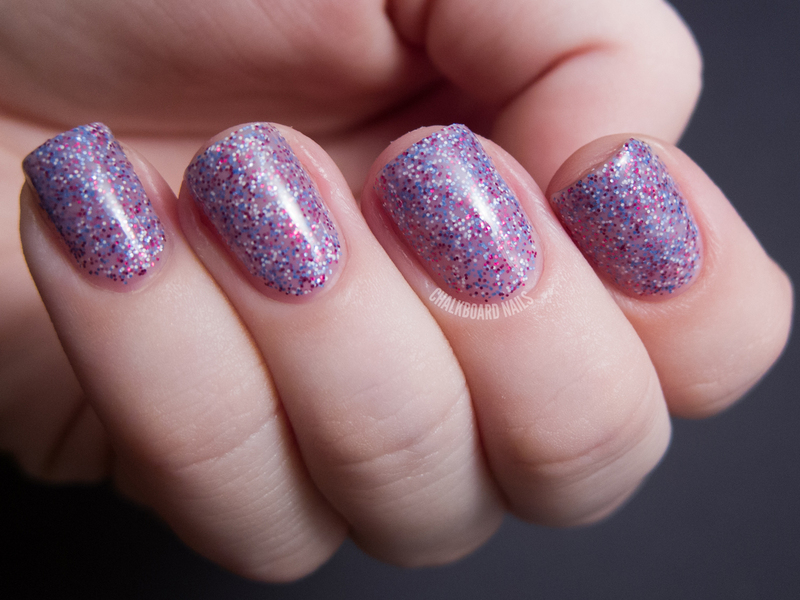 Emily is a microglitter polish that can be worn alone. 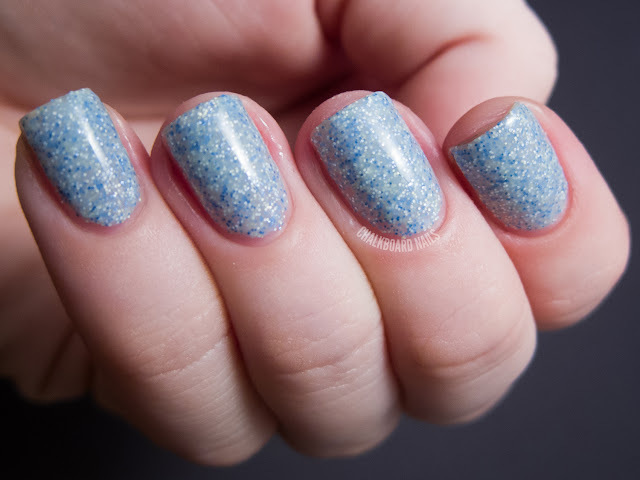 It is a blue base with blue, sea green, and white microglitters, and I've shown three coats here. I like the color combination in this one a lot. 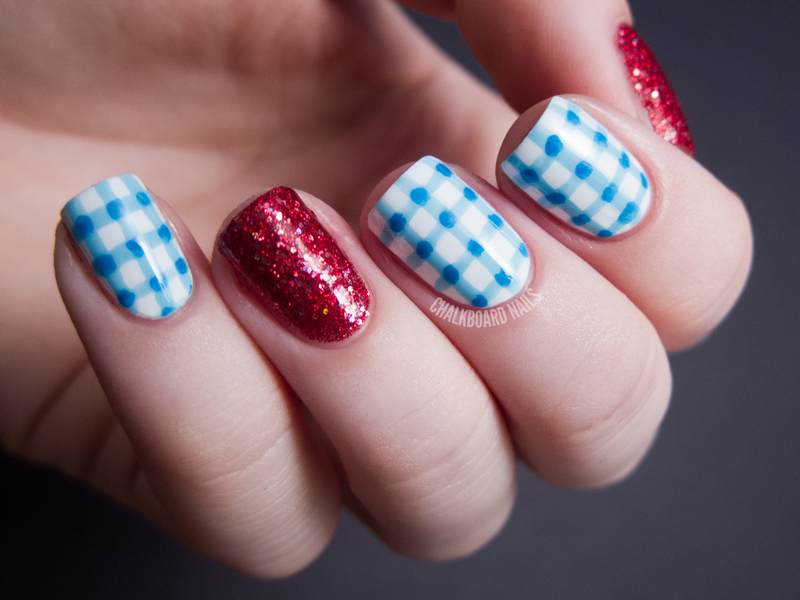 Lovely and speckled! Hanna is my favorite in the bunch! Similar in finish to Emily, Hanna is a microglitter in a tinted base. This time, it's a purpley base with white, blue, and magenta microglitters. Vaguely patriotic, almost! I love the contrast that you get between the base and its glitter colors. This is two coats. Spencer is a glitter with an edge. 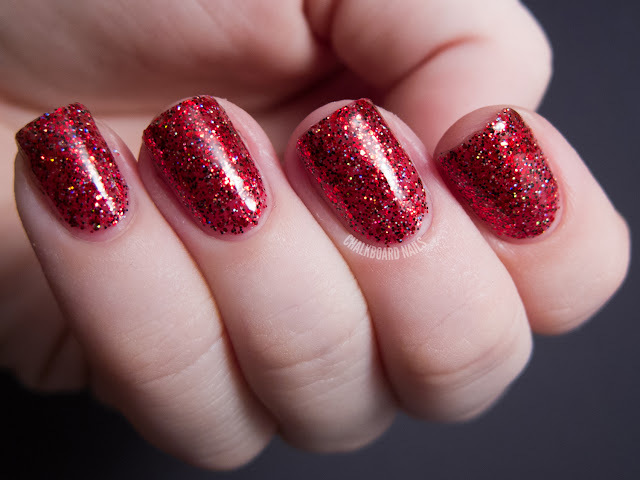 It's a red jelly base with red and black microglitters, as well as holographic silver glitters. 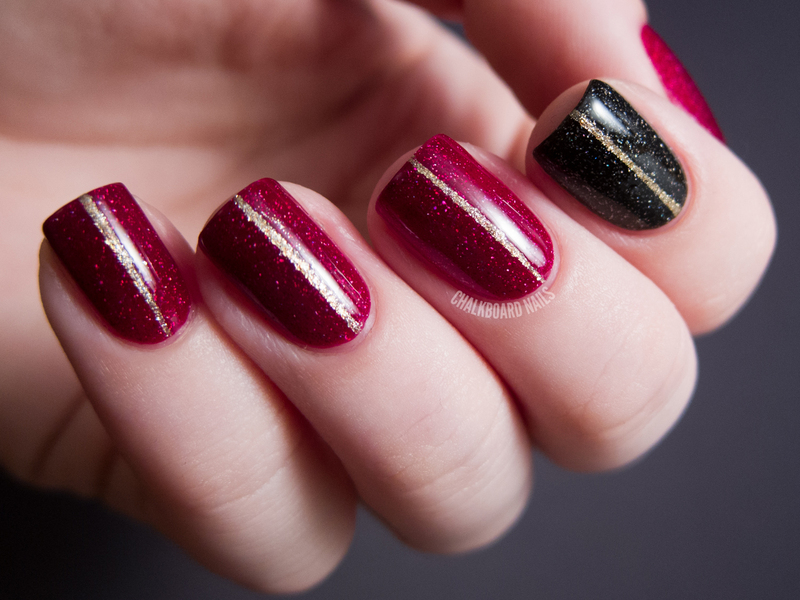 It's intensely sparkly and rich looking! 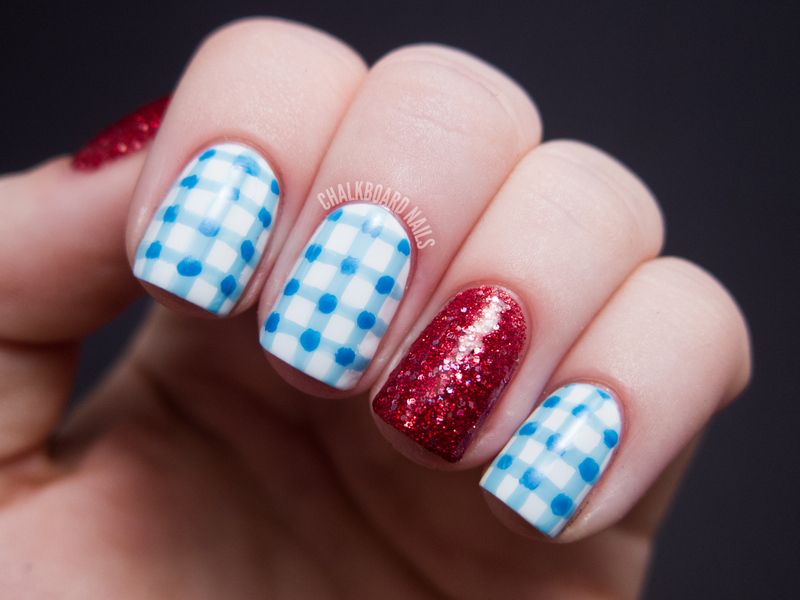 Definitely a good polish for an indie polish lover's date night. I've shown three coats here. As far as formula, all of these were great. The glitters spread evenly on their own, and the bases weren't too thick. They were juuuust right (said in my best Goldilocks voice)! Different Dimension is sold on Etsy, and you can also like the brand on Facebook for news and updates! This particular collection is sold as individual bottles and as a discounted set. This Halloween season, why let your body have all the fun dressing up in costume? I say costume your nails, too! 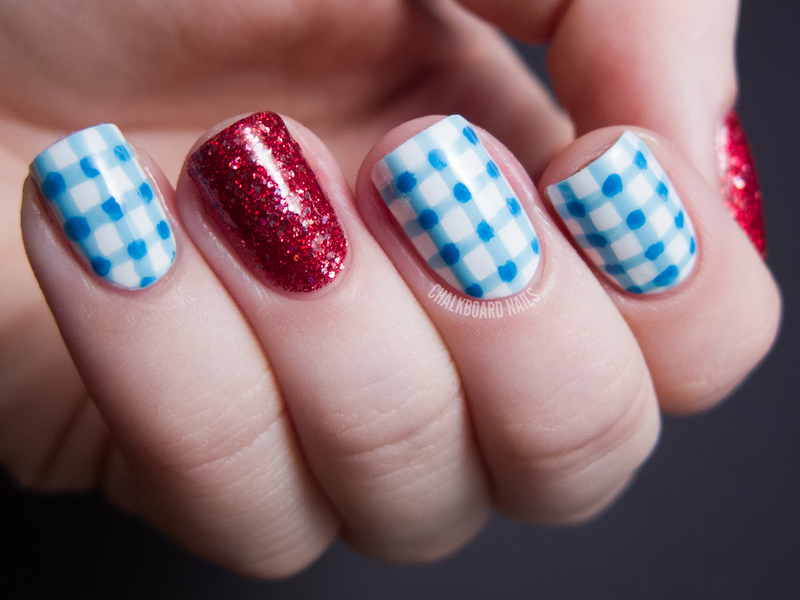 These nails were inspired by Dorothy from The Wizard of Oz. 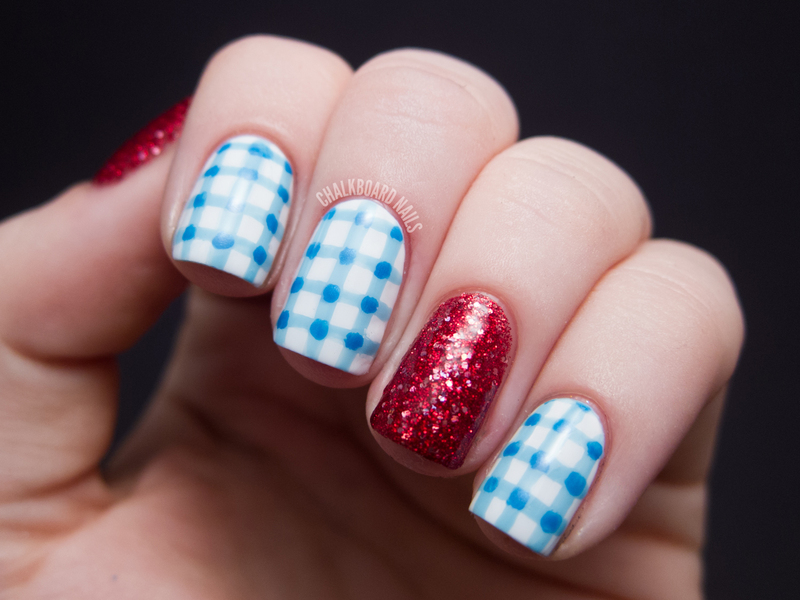 I'm sure you're all familiar, but I'm gonna go ahead and explain it anyway... the blue gingham was inspired by her dress, and the red glitter nails were inspired by the all-important ruby slippers. I used Wet N Wild Color Icon Rockin' Rubies for the red glitter. I believe that I used three coats? But I know what you're thinking. You're thinking that I should have used China Glaze Ruby Pumps. This is the prime opportunity, yeah? Well unfortunately I don't own it. Cue sad trombone. 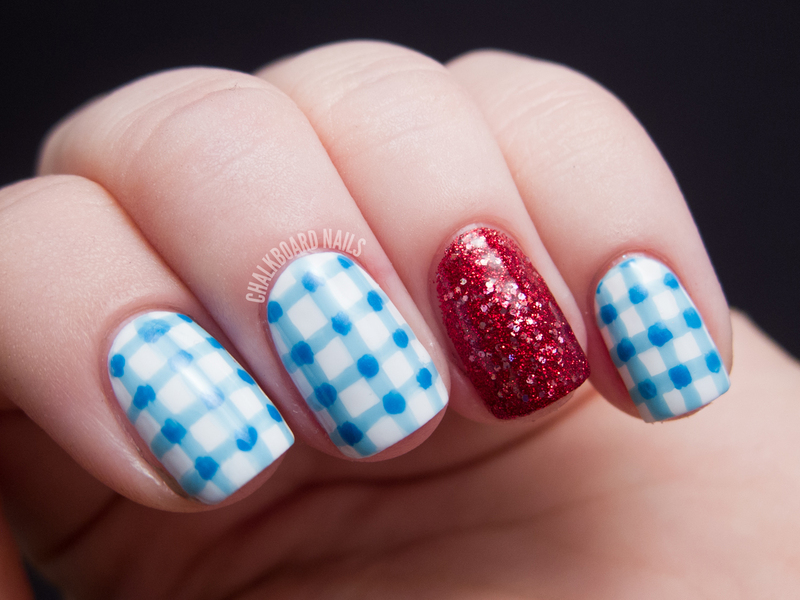 The gingham was painted on freehand using OPI What's With the Cattitude for the lighter color and China Glaze Sky High-top for the darker intersection areas. My white of choice for the base was OPI Alpine Snow. 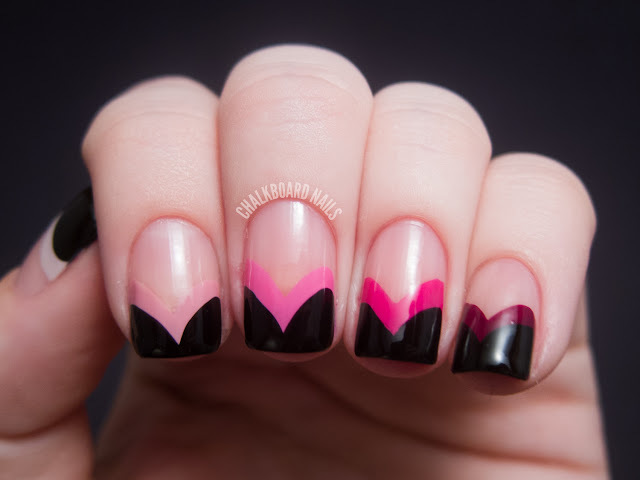 For some reason, I always have trouble doing horizontal stripes on my nails. Something about the curve of my nail or the stiffness of my brush makes it really difficult for me. They never seem to go on straight and usually get thicker at one end than at the other. HOWEVER, this time I tried to take it really slow and they turned out pretty good from the get go. I only had to do a little bit of correcting! 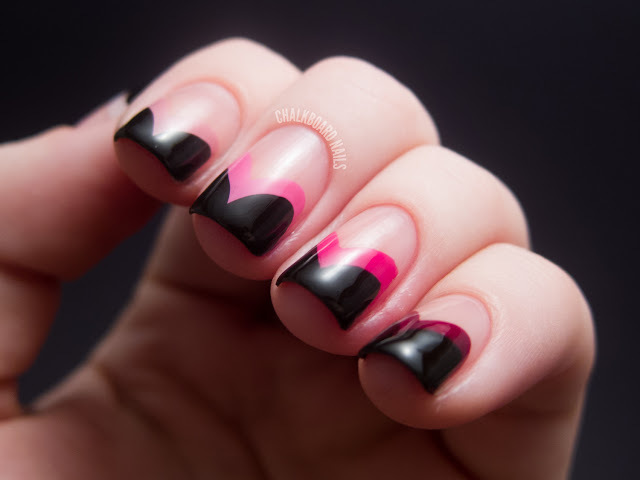 I think this manicure would be a great way for a beginner to practice their striping skills. The end effect is simple and cute, and most lacquer addicts could probably replace these colors with items they already had in their stash.